“They also serve who only stand and wait.” With this excerpt from John Milton’s poem “On His Blindness” serving as an epigraph to the opening chapter, The King’s Messenger – the debut novel from writer and Story Warren contributor Carolyn Clare Givens – reveals both the debt it owes to classic literature, and its commitment to carrying on these literary traditions. According to Givens in the notes at the back of the book, her story came to her “many years ago” in a college literature class and has wound its way slowly but surely to release this June in both print and digital form. 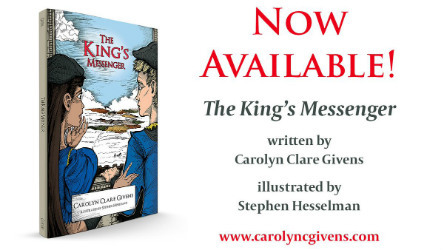 The King’s Messenger tells the story of Smuggins, one of eight appointed messengers to the ruler of a medieval kingdom. Smuggins’ job is to serve the King by responding to whatever task is set before him: traveling to take messages, protecting guests of the kingdom, or simply running errands within the central city of the kingdom, or beyond. Over the book’s 10 chapters, Smuggins’ tale unfolds gently, as he moves from eager, anxious young messenger to a mature and vital member of the King’s court through circumstances which force him to encounter themes of forgiveness, loyalty, courage, and above all, fealty. This last theme is what made The King’s Messenger most a thoughtful, engaging read to me. After all, we Americans live in a nation founded by overthrowing a monarchy and replacing it with a system which places power in the hands of the people and their representatives. And we live in a time when the greed for power has led to extreme inequity between rich and poor both nationally and abroad. Thus, any pledge of devotion to a lord or ruler has the smack of danger. What if the one in whom we place our trust betrays us or acts selfishly? As crafted by Givens, the Smuggins’ King is a just and wise ruler, worthy of fealty. Still, Smuggins struggles to make sense of how to serve his ruler and make the daily choices required of his position. As a storyteller, Givens mainly bypasses the path of allegory, as in Bunyan’s The Pilgrim’s Progress, choosing instead to craft a simply-told tale of a character’s quest for understanding of what it means to pledge loyalty, live under authority, and find one’s place in the larger world. As such, it feels more in spirit like wisdom literature, Hesse’s Siddhartha, for example. Givens’ prose has a sparse, timeless quality, in the tradition of classic Christian fables, with well-chosen imagery, a formal, graceful tone, and archetypal characters and settings which will ring familiar to those who have read any of the Inklings’ short stories. Givens also makes several pleasing storytelling choices which provide compelling material for readers young and old. For example, in the chapter “The King’s Forgiveness,” Smuggins fails at a dangerous mission given him by the King and returns to court disgraced and embarrassed. When he arrives, the King tells Smuggins how he had also been away from court seeking out his sworn enemy in battle. When they met in battle, however, the King chose not to defeat him, instead offering him forgiveness. “Tell me, do you think my Enemy deserves my forgiveness?” the King asks Smuggins. When Smuggins answers no, the King responds with a question: “Did you, Smuggins?” This juxtaposition is a compelling storytelling choice, forcing readers to consider the notion of forgiveness in a new light, without coming across heavy-handed or didactic. These sorts of small moments reveal The King’s Messenger ’s quality. Stephen Hesselman’s detailed pen and ink illustrations add to the timeless quality of the book, which I recommend as a worthy addition to home libraries for individuals or families seeking to share stories which embody virtues gently, but powerfully. EDITOR’S NOTE: Find The King’s Messenger now on Amazon (The King’s Messenger ) – you’ll be glad you did! Such a great review, Glenn, and CONGRATULATIONS, Carrie! Glenn, I cried when I first read this. Thank you for loving my book so well.